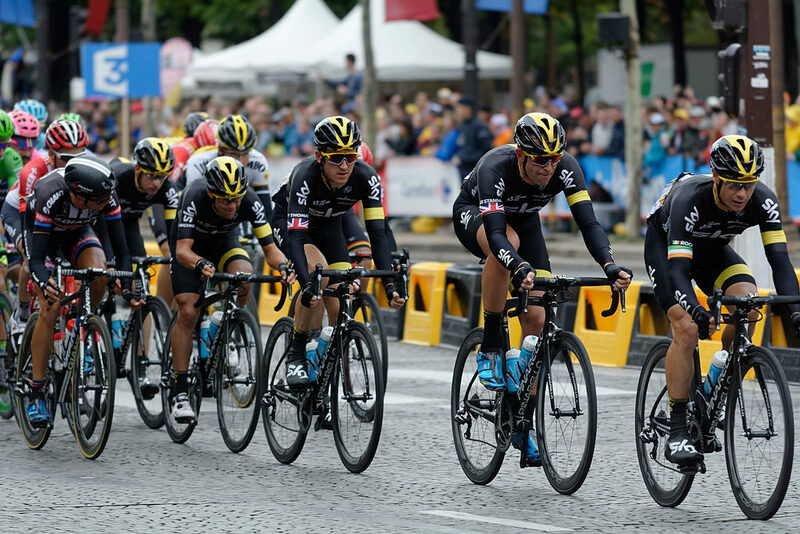 The Tour de France appears to be the ultimate individual sporting challenge – 219 riders cycle 3,540km in 3 weeks. But unlike any other race, 197 of these riders are not trying to win. Le Tour is a battle between 22 teams, each trying to get their leading rider into the yellow jersey, through the sacrifice of the “domestiques,” those riders who exist to serve the team. This article examines the story of what motivates the domestiques. Cycling on Le Tour is a team, not an individual, sport. The lead rider in each team is supported by eight others, knows as “domestiques”, who ride only to assist their leader. These men will fetch food and drink, provide a barrier against the wind, support in attacks from other riders and even sacrifice their bike if needed. Cycling great Eddy Merckx won the tour five times, but who remembers his team? Who remembers the names of the domestiques upon whose efforts his victories were built? Britain’s most successful Tourist, Chris Froome, rides for Team Sky. As the final kilometers of a stage approach, his teammates form a procession, testing the opposition, protecting him and waiting for the right time for a breakaway. As the finish approaches Froome pulls out of the slipstream and like a bullet out of a gun, shoots forward to take the race and the glory. Thomas, a veteran of seven tours, and the other domestiques never win and never get the glory. This year he won the first stage and wore the Yellow Jersey until stage five, when he handed it over to Froome on the first summit finish. On stage nine, whilst protecting his team leader he crashed and broke his collar bone and has had to retire. For Froome’s first victory in 2013 Thomas cycled the whole tour with a broken pelvis and was at Froome’s side as he claimed the title in Paris. It is almost impossible for a rider to win a stage without their help. The domestiques get a small share of the prize money and admiration from their peers, but what really motivates them? Why do people make extraordinary acts of self-sacrifice for the benefit of their team and the glory of someone else? Our research into successful teams shows that they demonstrate what psychologists call strong Social Identities. This means that team members have internalised their membership of the team, making it part of their sense of “who they are” and contributing directly to their self-esteem. When the team does well, those who strongly identify with it feel a direct increase in their self-esteem – they feel good, they feel pride. They are acting out of self-interest but the self they are putting first is “us”. This has a profound impact on their behaviour as they act to create situations that increase pride in the team and minimise situations that reduce it. To find out more about the research download our White Paper on The New Science of Great Sports Teams. In organisations, team centred behaviour is characterised by cooperation, helping, innovation and upholding reputation that cannot easily be proscribed in goals or measured. Research by Professor Van Knippenberg, from Erasmus University, suggests that by focusing on “team level motivation” successful organisations encourage Social Identity whilst, in contrast, ordinary organisations that focus on individual goals and behaviour, undermine it. In the last ten years, teams have revolutionised road cycling by taking the concept of teamwork beyond the boundaries of the team, asking sponsors and suppliers to contribute and act as part of the team. For example, rather than having the frame, handlebars, and tyres designed and developed by separate companies with little interaction, teams adopt a “Formula One” relationship with sponsors and suppliers to take full advantage of the combined resources of several organisations working in close communication. Professor Van Knippenberg recognises that leaders, like Brailsford, have a critical role to play in encouraging performance in teams. He argues that transactional approaches to motivation, such as the “star salaries” paid in football and “situational leadership” techniques that are a popular part of many leadership courses, actually reduce motivation in complex, interdependent, work situations and make extraordinary team performance less likely. Personality and motivation differences are often used to argue against team focused performance management. It is claimed that high achievers are too often “individualistic people” who will not be motivated to contribute to a team. However, Van Knippenberg’s research shows that the opposite is true; “Self-interested” people respond more strongly to “team” motivations than “socially-interested” people, when team motivation is structured so that the self they are interested in becomes the team. To generate team level motivation requires more than the traditional “vision and values” off-site. Insights from the psychology of team dynamics demonstrate that team performance is moderated by: the salience of team members’ identification with the team; team norms; team goals; and the sense of control that team members believe they have over their success. These variables have been incorporated into the TRIBE model developed at the Centre for Team Excellence. The idea of the individual sportsperson winning alone is a myth. The greatest achievements in sport, science, the arts and business, always come from teamwork. Great Tour de France victories are the result of team effort, even if they are remembered as individual triumphs. In organisations how often does an individual take the praise and get handsomely rewarded for successes that, if we look behind this façade, are build on the efforts of a team of anonymous domestiques?